We’ve been very lucky to be offered a new Candy GrandO Evo 1683DW Washing Machine to review for Appliances Online. And I can certainly say I’ve been putting it through it’s paces since we came back from our week away. As a family of four, like many others we have a mountain of washing. What with school uniform, Brownies, Rainbows, Swimming and Dancing outfits too, the pile just seems to get bigger by the second sometimes. So, the fact that the Candy Evo has an 8kg drum and a 1600 rpm spin speed is a godsend. I was renowned for overfilling our last machine, so this one seems to be coping very well so far. Plus I never seem to stay on top of the washing as I’d like to, so there’s always more to tackle than I think. Thank you 8kg drum! But that’s just the tip of the iceberg as far as gadgets and gizmos go. The Candy Evo has the lot. Firstly there’s the quick wash setting. Going to bed and realised you’ve forgotten to wash that PE Kit for the morning? Well never fear. Pop it in the machine on the quick 14 minute cycle and it’ll be ready before you’ve brushed your teeth for bed. Hang it up overnight and there’s one less thing to worry about. Secondly there’s the stain blaster settings. In our house, tops are always covered in food, paint, chocolate and mud. And that’s not just me! School uniform tops are white too so the stains never seem to quite come out, but this machine has the option of 3 different settings for stain severity. Choose the relevant setting as per the stain level of your load and the machine adjusts the time of the wash accordingly. And I must say, these settings WORK. Some of the girls’ white socks that had seen better days are much brighter and cleaner after a few washes in the new Candy. I do like this option, and I’m really pleased that it actually works. Then it has an allergy setting, which is great for us as we have some very sensitive skin in our household and the usual, delay start and fast iron buttons too. Again everything works really well and just as it should. I couldn’t be happier with the performance. How does it look? Well judge for yourselves from the picture really, but I’m really happy with the look of it in my kitchen. I particularly like the digital display and silver rim on the door. Aesthetically that works really well for me. I was skeptical of how the Candy machine would look, and wasn’t sure it would be too stylish, but actually I was proved wrong. So, I suppose you can tell that I really rather like this washing machine, and there aren’t any real downsides that I’ve found after a month of using it. If I’m being picky I can’t quite fathom why the displayed time seems to jump around. It’s nothing major but once all the settings have been selected, the digital time of the proposed wash is displayed. Press Start and off you go, but all of a sudden a 2 hr 20 min wash drops to 2hrs 05 for example. I’m not sure if it re-evaluates everything once it’s started and knows it needs less time but this does happen. Having said all that, it really doesn’t seem to have any effect on the wash, or the performance so it’s not something I’m grumbling about! Overall, this Candy GrandO Evo washing machine is a big hit in my eyes and if you decide to buy one of these I really don’t think you’ll be disappointed. Disclosure: I was provided with the washing machine for the purposes of this review. The comments and opinons are genuine, honest and my own. I think it adjusts according to weight? Great review, and YAY for a new washing machine. With the time thing, if it’s the same as mine, after a few mins and the water has filled, my machine weighs it, and so re evaluates how long it will take to do the wash? We got one of these in December 2012. It’s now February 2013 and it’s broken down for the third time. It’s chewed up 2 rubber gaskets between the drum and the door, had a complete new drum replaced, and now the new drum doesn’t turn at all. Owned it for 10 weeks, and spent 4 weeks waiting for engineers to come to mend it. That’s not good news Sue! Ours is still going strong after 6 months and coping very well with family washing! This is a great washing machine it has a good drum size of 8kg and the 1600 spin speed means the clothes come out extra dry. 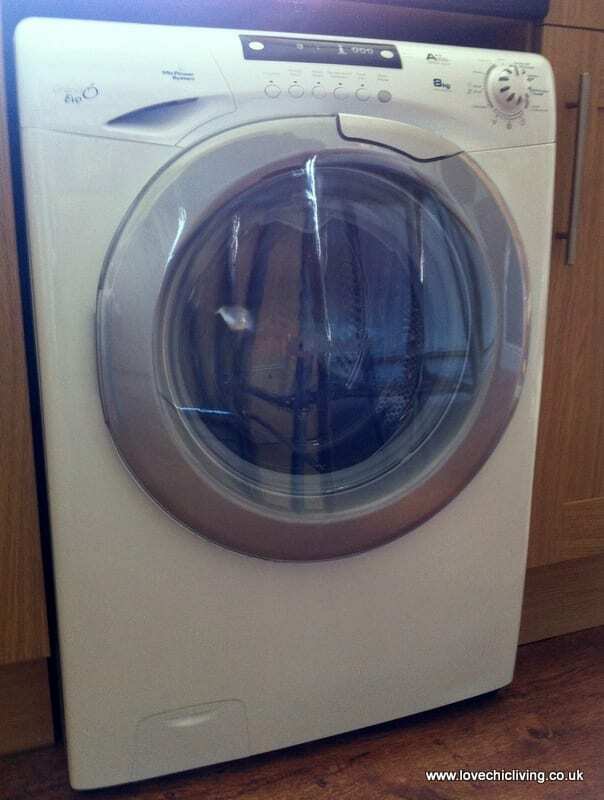 I think this washing machine is rubbish!!! I have only had mine 5 months and the spinner won’t work if I put a towel in the wash I have take it out wring it by hand put it back into the machine for it to spin. I don’t recommend anyone having this machine. I could pick it up and throw it into the garden.